Slydigs supported the main act that evening. The band formed in Warrington, UK, and in terms of sound mixes a lot of what seem to be their personal icons – such as The Beatles, U2, Oasis and naturally enough The Who. The four members Dean Fairhurst (vocals, rhythm guitar), Louis Menguy (lead guitar, backing vocals), Peter Fleming (drums) and Ben Breslin (bass, backing vocals) work well together, to me Louis Menguy, though, seemed the most promising of the four. Interestingly enough, frontman Dean Fairhurst did not leave a very good impression. Firstly, he looked extremely annoyed, sometimes even sorry to be there. Secondly, he doesn’t have a bad voice, but the backing vocals actually sounded better than his own. Maybe he really had a bad day. And even though Slydigs have some cool songs, especially The Truth Will Be Found and Catch A Fading Light, they didn’t quite manage to convince the audience with their blues rock. 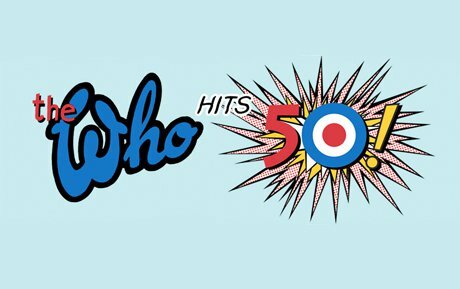 One of England’s most iconic rock bands are without doubt The Who. The band who started its musical career in 1964 with Roger Daltrey (vocals), Pete Townshend (guitar), John Entwistle (bass) and Keith Moon (drums) propelled themselves to immense success as one of the loudest bands in rock history. After the passings of Moon (1978) and Entwistle (2002), Daltrey and Townshend are the only founding members left in the band. They are currently on their 50 Years Tour, securing instrumental support from several fellow musicians: Simon Townshend (guitar, backing vocals), Pino Palladino (bass), Zak Starkey (drums), Loren Gold (keys, backing vocals), John Corey (keys, backing vocals) and Frank Simes (keys, backing vocals), who have all been associated with The Who for many years. That night they played Vienna’s Stadthalle. They started the concert with one of the many classics: Who Are You. After that, they played a few songs from the sixties, such as The Kids Are Alright, I Can See For Miles and My Generation. Within the set there were some rarer songs, too – I personally enjoyed the instrumental The Rock very much, but the video wall sure added to that with great montages all the way through. Most songs were from the albums Tommy and Quadrophenia, arguably their most important releases. Of course it did not look and sound like in the old times – Roger Daltrey’s voice is too weak for that now. He seemed tired, sometimes even hit very wrong notes. But both band and audience seemed very nostalgic, and they did manage to secure this touching ambience, not only by their signature stage moves such as Townshend’s windmill and Daltrey’s microphone lasso. In the end, one might say audience applauded The Who’s general acquisition throughout fifty years, rather than their interpretation of it that very evening, as Townshend confirmed: “I wrote these songs when I was a little boy. So you are applauding my little boy now.“ But isn’t that just lovely?